Last night I thought I would try out a new quick and easy recipe for dinner. I love ground turkey and try to swap it out for ground beef sometimes to change things up and make sure we are not consuming too much red meat. I often just brown it up and toss the ground turkey with steamed veggies and a little soy sauce and serve it over rice, the whole family always loves that simple meal. 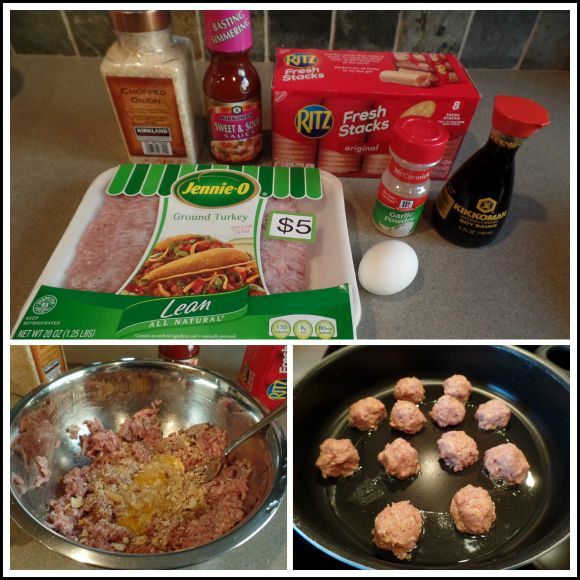 Last night I thought I'd try making turkey meatballs. 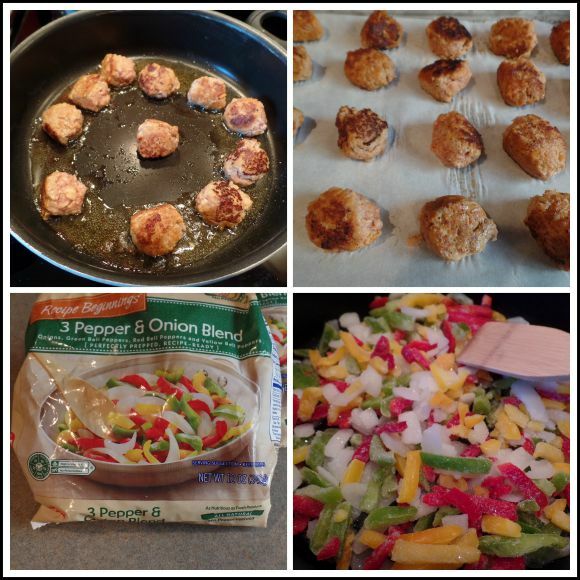 Here's how I made the turkey meatballs and turned them into a yummy simple dinner. I stared with a pound of ground lean turkey, and in a bowl mixed in an egg, a 1/4 teaspoon of garlic powder, 2 teaspoons of soy sauce, 1/8 cup of ketchup, 1 1/2 Tablespoons of chopped dehydrated onion, and one sleeve of Ritz crackers finely crushed (about 20 or so crackers). I prefer dehydrated chopped onions instead of fresh in both my meatballs and meatloaf because sometimes a fresh onion will not cook as fast as the meat and then you have under-cooked onion inside which makes the texture odd, also it can cause the meatball to fall apart unless it is very finely chopped. Plus I like the slightly sweet taste of the dehydrated onions. I mixed all the ingredients together with a fork until well combined. I made equal portions using a cookie scoop, you could also just use a spoon, shaped the mixture into meatballs and browned in a thin bit of vegetable oil over medium heat, turning until browned on all sides. Then I transferred the meatballs to a parchment lined baking sheet and baked at 375 F. until cooked through. I always test my meat with a meat thermometer to check for correct temperature, especially with poultry. While the meatballs were baking I got the rice cooking in the rice steamer, just make enough for your family. I also cleaned out pan I used to fry the meatballs and added a couple tablespoons of butter and a little water and sauteed two bags of frozen pepper and onion blend until they were cooked. When the meatballs were cooked through I set them aside to cool a bit and warmed up the sweet and sour sauce in a large pan (large enough that the meatballs will fit into it), I thinned out the sweet and sour sauce with a little orange juice, you could also use apple juice. When the sauce was warmed I carefully transferred the meatballs to the sauce, and gently tossed them to coat. These turkey meatballs weren't as sturdy as beef would be so I had to be careful not to break up the meatballs. 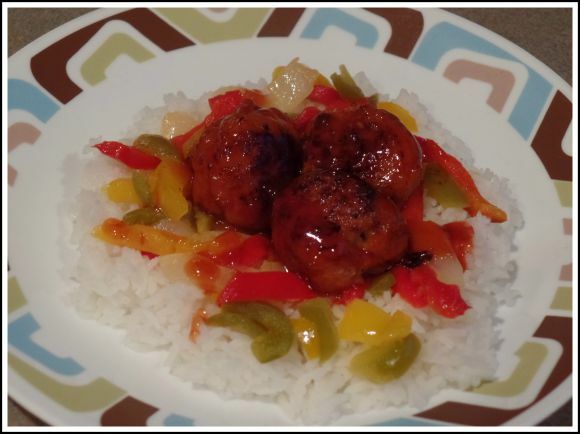 I served the meatballs with their sauce over the bell pepper and onion mixture over a bed of rice. Overall it was a tasty meal, although I would really like to try to make my own sweet and sour sauce, as the brand I used was a little to tangy for our taste, but everyone still enjoyed the meal, and we will definitely have to have it again. 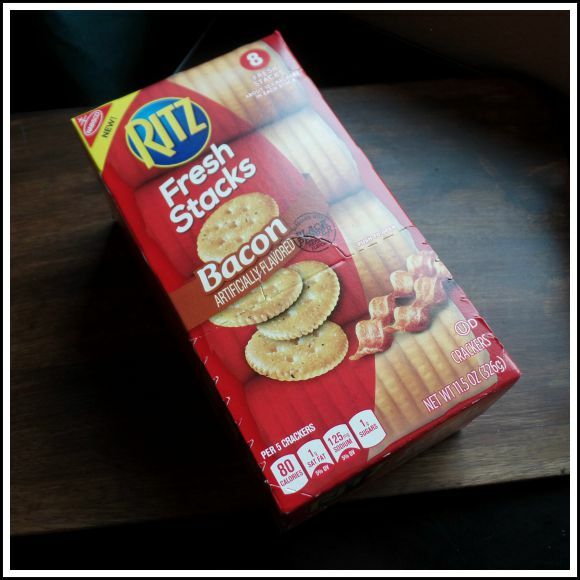 While hubby was picking up a pack of Ritz crackers for my meatball recipe, I asked him to check and see if they had the new bacon flavored Ritz in stock, they did, so he brought home a pack. Have you noticed all of the "special edition" flavors different classic brands are doing lately? Oreo cookies keep coming up with limited edition flavors or colors, and Lay's potato chips have their flavor contest chips the past few years. Although it's a little gimmicky, it is also kind of fun to try out new flavors, sometimes they are yummy, like the new Golden Oreo Thins that I just love! We have the four new Lay's chips to try out, have you tried them yet? I am waiting for the whole family to try them together and then vote on our favorite. In my last post I mentioned some of the wildfires affecting the West Coast, last week they got so bad, and then the wind brought smoke all down the valley. I noticed a brownish fog look to the sky towards the north and was wondering if we had a nearby fire. By the end of the day we were covered in a fog like smoke, the air was thick and smelled of smoke. You can see in the pictures below how the smoke looks like a fog covering everything. It was definitely an odd feeling for sure. I called my son at work to make sure if he had to work outside that he wore a respirator since he suffers from asthma, he assured me that the guys spending time outside were wearing masks and luckily he didn't have much outdoor work that day. On Sunday we went out for church and to stop in town for a bit, at that point it was still smokey looking but not as thick. 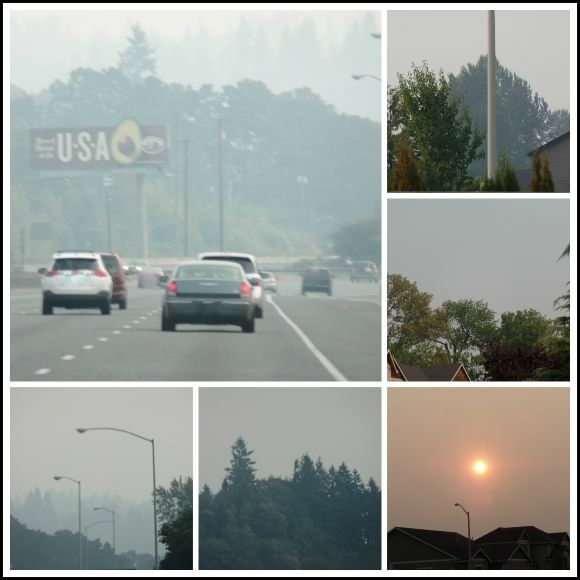 Last year we had a wildfire one town over and the sky was full of smoke and ash. This year is even worse for wildfires, so many people have lost their homes and some of the brave firefighters have been badly injured or worse, lost their lives. It breaks my heart, and I so appreciate those brave men and women willing to risk their lives to protect others, they and those who have lost their loved ones and their homes are in my daily thoughts and prayers. Today the smoke is much clearer and I am praying we get a nice summer rain to help get all the fires under control! 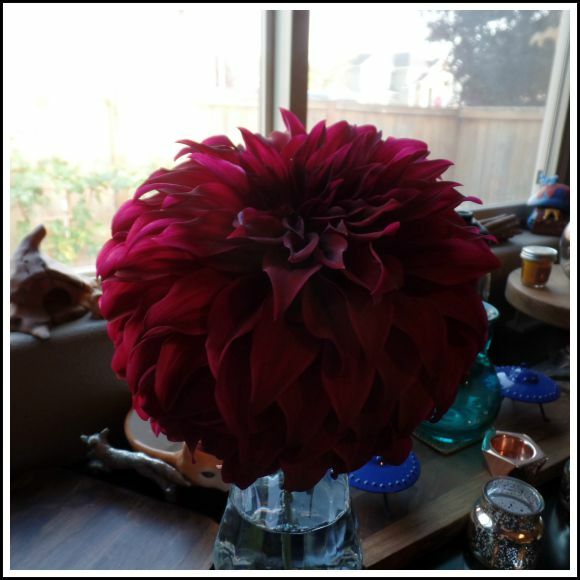 Thanks so much for sharing this recipe at my party and praying that the wildfires stop. Wow! That was really a close call for you with the fires. Glad you are safe! I always eat cheese with my crackers, so maybe those Ritz crackers would be good. Tried the new chips and didn't like any of them. Then I decided to go on a diet. So your beautiful pictures of meatballs are making me very very hungry! Have a lovely Labor Day, April!